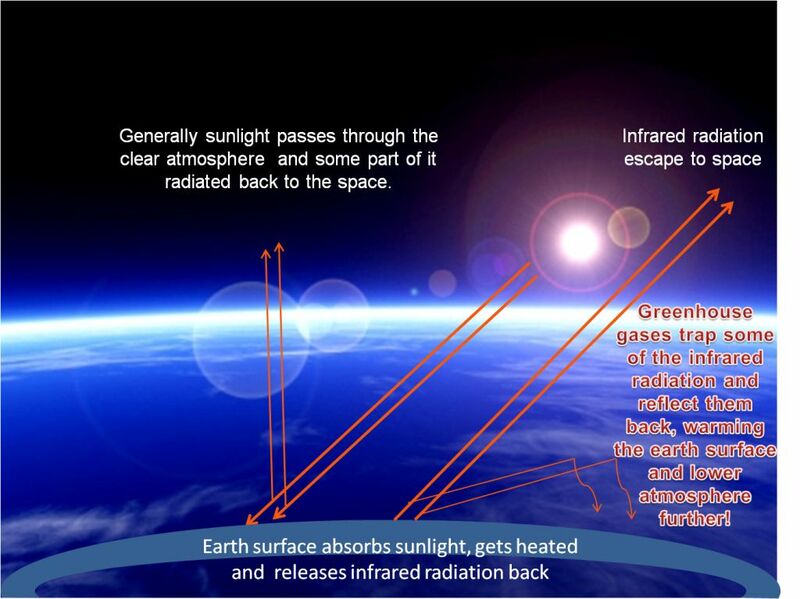 Generally greenhouse effect occurs when solar radiation gets trapped in earth atmosphere. Solar radiation largely passes through the earth’s atmosphere and warm up the planetary surface. A certain portion of this radiation (approximately 30%) gets reflected directly back to the space. The rest of it gets absorbed by the planet surface and atmosphere. Once absorbed, this energy is released back in the atmosphere and space in the form of a slow moving energy known as infrared radiation. When some part of these infrared radiations gets trapped by certain gases in the atmosphere like water vapor, carbon dioxide, ozone, methane, nitrous oxide etc. and radiated back towards the earth surface, greenhouse effect occurs. These trapped infrared radiations increase the average surface temperature than what it would be in the absence of those gases. As these gases act like the glasses of a greenhouse to trap radiation and increase the heat inside; they are known as greenhouse gases. Most of these greenhouse gases occurs naturally and without this life on earth would not be feasible. Without this natural phenomenon, earth could be much colder than it is now: that is freezing minus 18 degree centigrade than the present 15 degree centigrade (source: Government of Canada). But over the past years, there is excessive accumulation of greenhouse gases has occurred in the atmosphere due to human activities and industrialization. This intensification of effect through human activities or anthropogenic factors is known as Enhanced Greenhouse Effect. Over the last centuries, increased human civilization and industrialization have contributed heavily in the greenhouse gas emission and accumulation. 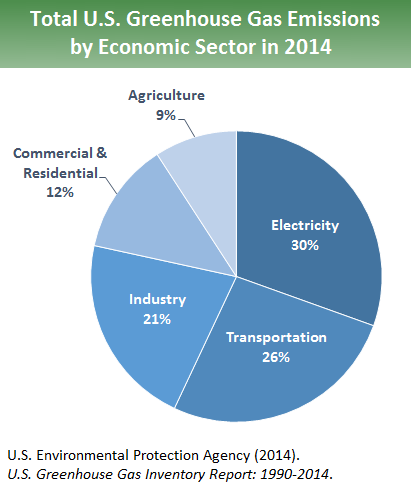 The largest sources of greenhouse gas resulted from human activities include burning fossil fuel, transportation, industrialization and deforestations. Carbon Dioxide: Carbon dioxide is the most important greenhouse gas emitted by human activates. Increase use of fossil fuel for civilization and industrial activities is the primary source of carbon dioxide. Also, deforestation contribute in increased carbon dioxide level in the atmosphere as forests usually act as CO2 sink. Methane: Methane is another prominent greenhouse gas that generated from various agricultural activities, farming and biomass burning etc. Nitrous Oxide: Nitrous oxide is also generated from agricultural activities like fertilizer use and biomass burning. 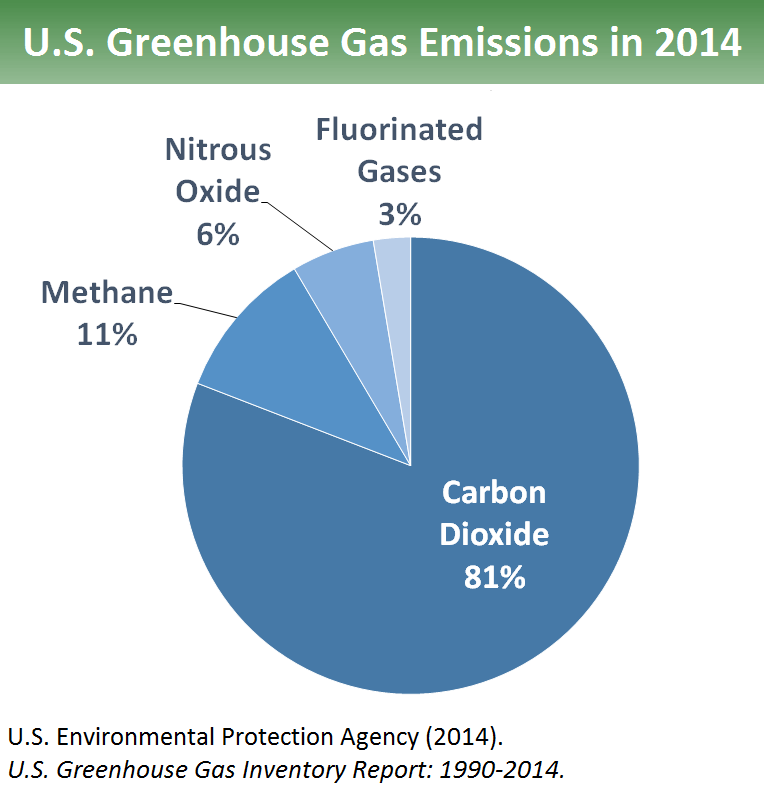 Fluorinated Gases: Fluorinated Gases like hydrofluorocarbons, perfluorocarbons (and sulfur hexafluoride etc. are resulted from different industrial activities, use and manufacturing from different consumer products. These green house gases travel globally. As a result, although some developed nations contribute more to green house gas generation, all the world will suffer from their direct and indirect effects. That is why greenhouse gas reduction required joint global efforts and should be an international priority.